Soft Cover, 288 pages, 5 x 8.25. "We faced many scary moments over the years, both spiritualstaring at the brink of bankruptcyand physicalstaring down the barrel of a 9mm pistol. When you start a business, it is not only your money and your investors' money that is on the line, it is your dream, your idea, and sometimes your life." Is this a book for beer aficionados or business enthusiasts? Both, and it's as refreshing as a cold brew. In Beer School, authors and entrepreneurs Steve Hindy and Tom Potter share the improbable saga of Brooklyn Brewery, the company they grew from a home-brew hobby into a multimillion-dollar businessall in the most competitive beer market in the United States. If you have a thirst for entrepreneurial success, drink up. If you are a business manager or owner and want fresh ideas and insight, tap in. From the beginning, the odds were against Steve and Tom. It's estimated that eight out of ten businesses fail in their first year. Yet these entrepreneurs succeeded in a competitive arena dominated by mega-corporations and mega-money. The brew they began making in a Brooklyn brownstone over twenty years ago is now sold around the world. Their story, recounting the fears and obstacles they faced and the decisions and successes they shared, will inspire you. Like discovering the perfect brew or starting a business, reading this book is a heady experience. "A great city should have great beer. New York finally has, thanks to Brooklyn. Steve Hindy and Tom Potter provided it. Beer School explains how they did it: their mistakes as well as their triumphs. Steve writes with a journalist's skepticism-as though he has forgotten that he is reporting on himself. Tom is even less forgiving-he's a banker, after all. The inside story reads at times like a cautionary tale, but it is an account of a great and welcome achievement." "An accessible and insightful case study with terrific insight for aspiring entrepreneurs. And if that's not enough, it is all about beer!" "Great lessons on what every first-time entrepreneur will experience. Being down the block from the Brooklyn Brewery, I had firsthand witness to their positive impact on our community. I give Steve and Tom's book an A++!" 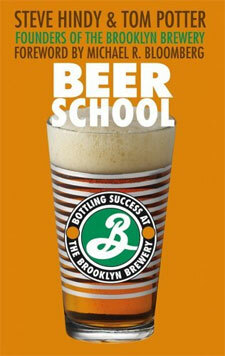 "Beer School is a useful and entertaining book. In essence, this is the story of starting a beer business from scratch in New York City. The product is one readers can relate to, and the market is as tough as they get. What a fun challenge! The book can help not only those entrepreneurs who are starting a business but also those trying to grow one once it is established. Steve and Tom write with enthusiasm and insight about building their business. It is clear that they learned a lot along the way. Readers can learn from these lessons too." "Although we (thankfully!) never had to deal with the Mob, being held up at gunpoint, or having our beer and equipment ripped off, we definitely identified with the challenges faced in those early days of cobbling a brewery together. The revealing story Steve and Tom tell about two partners entering a business out of passion, in an industry they knew little about, being seriously undercapitalized, with an overly naive business plan, and their ultimate success, is an inspiring tale." -Ken Grossman, founder, Sierra Nevada Brewing Co.
STEVE HINDY is President and cofounder of the Brooklyn Brewery. A former Middle East correspondent for the Associated Press, he is also a director of Brooklyn's Prospect Park Alliance and the Brewers Association. Hindy has a master's in teaching English from Cornell. TOM POTTER cofounded the Brooklyn Brewery in 1987. He served as its CEO and chairman until retirement in 2004. Previously, he was an assistant vice president at Chemical Bank, where he financed the acquisition of assets valued in excess of $1.5 billion. Potter graduated from Yale and has an MBA from Columbia.